Now we will look into an automated process that allows us to call the Office 365 IP Address and URL Web service and to have the news Endpoints returned in FQDN Format. The full unformated worldwide list can be found here in JSON format & here in CSV format. As part of the article, it explains how you can access the changes, essentially the newest updates since the month before. You can see the data here. This can be changed as and when a new version is published by Microsoft, but of course the output via the browser is in JSON format. 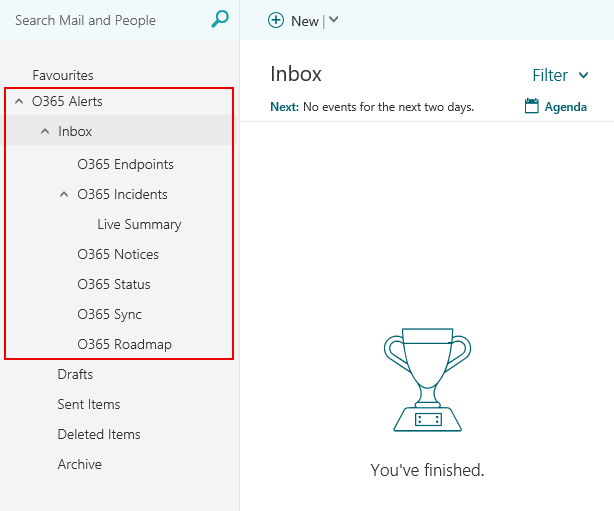 So let's walk through how I have captured the new FQDNs and emailed them to a shared mailbox. I did this with some help from Paul Andrew as he had detailed a good deal of the process at this blog. Go to SharePoint and click the Lists menu item, then click New, and select List to create a new list. Using Microsoft Outlook. If you have a need to receive an email, then to file it in a sub-folder based on 2 time parameters this method should do the trick. 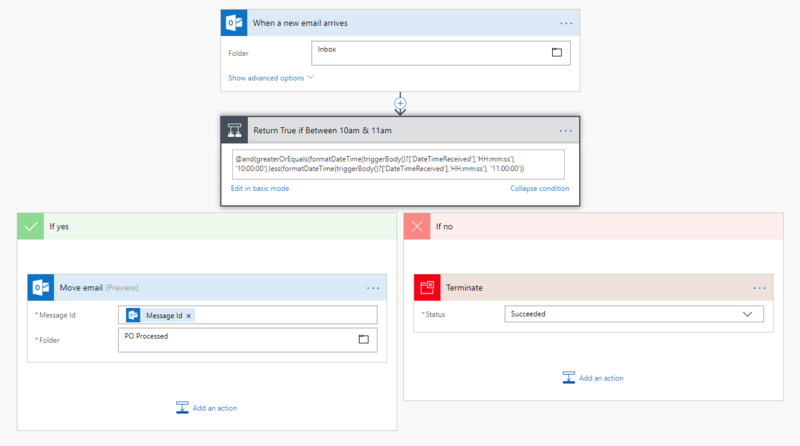 Below I will demonstrate using the Flow trigger When a new email arrives then passing a condition that will return true if DateTimeReceived parameter is within the time constraint. In Lehman's terms, if the email arrives between 10am & 11am it will be moved to the sub-folder. If not, it remains in the inbox. There are several uses for Apps in Azure Active Directory but in the most, you are opening yourself a gateway to harness the power of an API. Below I will walk you through the required steps in order to create an app called O365ServiceAPI. Once we have this app created you will then be able to make API calls to the Office 365 Management APIs. Once this has been created, you will have 2 bits of information, your Application ID or ClientID and your key, or SecretID. In addition to the ClientID & SecretID you will require your Directory ID or TenantID and here is how to go about getting that. 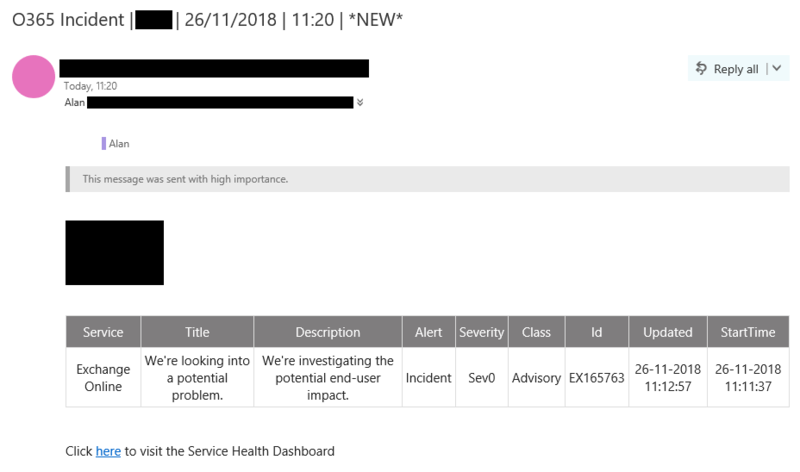 Go to Azure Active Directory Admin Console at http://portal.azure.com and log in as a Global Administrator. 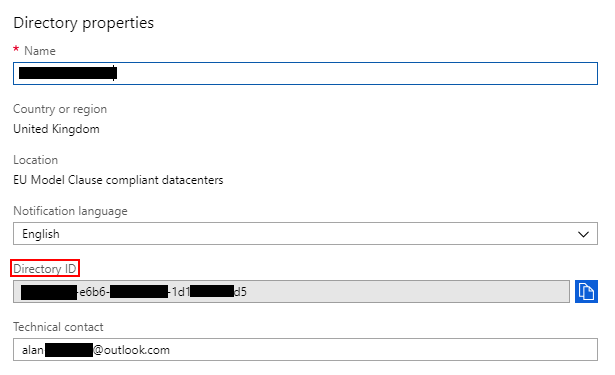 Click Azure Active Directory, and under Manage click Properties. Look for Directory ID and copy it to your clipboard. Open a new .txt file (or similar) and keep a record of this value which will refer to now as TenantID.